Expeditions from western Europe to recover Jerusalem and the holy sepulcher from the control of the infidel. The undisciplined mobs accompanying the first three Crusades attacked the Jews in Germany, France, and England, and put many of them to death, leaving behind for centuries strong feelings of ill will on both sides. The social position of the Jews in western Europe was distinctly worsened by the Crusades, and legal restrictions became frequent during and after them. They prepared the way for the anti-Jewish legislation of Innocent III., and formed the turning-point in the medieval history of the Jews. The outbursts did not come unexpectedly. Soon after Peter the Hermit and Urban II. had aroused the enthusiasm of French chivalry at the Council of Clermont in 1094, Godfrey de Bouillon declared that he would avenge the blood of Jesus on that of the Jews, and leave none of them alive, while his companions threatened to exterminate the Jews if they would not become converted. The Judæo-French communities accordingly sent letters to those on the Rhine, who thereupon appointed a fastday to avert the evil (Jan., 1096); and when Godfrey de Bouillon came to Cologne and Mayence each community made him a present of 500 silver marks to secure his protection. When Peter of Amiens arrived with the crusaders at Treves early in 1096, he did not directly arouse the people against the Jews, but left a general ill will against them throughout Lorraine, especially through the influence of the knight Volkmar, who declared that he would not leave the kingdom until he had slain at least one Jew. In the spring of 1096 twenty-two Jews were slain at Metz, and on May 3 the crusaders and accompanying rabble attacked the Jews of Speyer, slaying eleven of them and only being restrained by the exertions of Bishop John from putting them all to death in the synagogue. On May 18 the Jews of Worms were all slain except a few who were forcibly baptized or who took refuge with the bishop. Their houses were destroyed, and even the corpses denuded. Many slew themselves rather than fall into the hands of the mob. The bishop's palace was stormed a week later, and all those within it were put to death. The number of the slain is said to have amounted to 800, though the extant list of names reaches only 400 (Salfeld, "Martyrologium," p. 107). One of the richest Jewesses, named Minna, when surrounded by the mob and implored by some of her friends among the nobles to accept baptism, resolutely refused and was put to death. Several were drowned, and Mar Shemariah with his whole family was buried alive amid the jeers of the mob, who nevertheless during the entombment offered in vain to grant them safety if they would become converted. 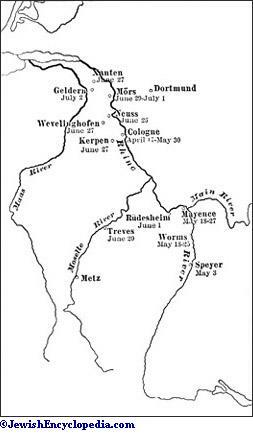 Map of Rhine Region, Showing Sites, with Dates, of Anti-Jewish Outbreaks During the First Crusade, 1096. On the same day Count Emicho arrived at Mayence with a numerous band of crusaders, but he was not admitted by the archbishop Ruthard, who had promised protection to the Jews. Two days later, however, Emicho forced admission through a side gate, and, notwithstanding the armed defense of the Jews, succeeded in destroying them all except Kalonymus, the president of the congregation, and fifty-three others, who hid themselves in the treasure-house of the cathedral. A number of Jews who had defended themselves all day in a fortified position found it untenable as night came on, and, rather than fallinto the hands of the enemy, killed themselves. The corpses after being stripped were cast into nine graves; they are said to have numbered 1,014. Mar Isaac ben David, after having submitted to baptism, burned down his own house and the synagogue and perished in the flames, because it had been rumored that the Christians intended to turn the synagogue into a church. Kalonymus and his 53 companions were taken by bishop Ruthard in boats to Rüdesheim and kept there for some time; but on June 1 he declared he could not protect them unless they submitted to baptism. They determined to slay themselves rather than do this, and Kalonymus put his own son Joseph to death, and then, wild with grief, attempted to kill the archbishop, but was prevented and killed. The crusaders again attacked the houses and synagogue of the Jews of Cologne on May 30; but here the citizens protected the Jews in their own houses until Archbishop Hermann, on June 3, sent them for safety to seven neighboring villages, Neuss, Wevelinghofen, Altenahr, Xanten, Geldern, Mörs, and Kerpen. The crusaders followed them to these places, killing 200 in Neuss and Altenahr, in several cases throwing old women and young children into the river (Salfeld, "Martyrologium," p. 133); forcing them to be baptized at Geldern and Kerpen; while in Wevelinghofen, Altenahr, and Xanten the Jews slew themselves rather than change their faith. The 300 Jews of Cologne who found themselves at Altenahr selected five men to slay the rest. In the month of June the crusaders reached Treves, and some of the Jews at once slew themselves, a number of Jewesses throwing themselves into the river. The rest betook themselves to the palace of Archbishop Egbert, who attempted in a sermon to persuade the people to spare the Jews, but was himself maltreated and besieged in his palace for a week, at the end of which he told the Jews there was no hope for their lives but in baptism. When they still remained obdurate some of them were exposed by him to the crusaders, who immediately slew them. The rest thereupon accepted baptism. The same fate befell the Jews of Regensburg, while those of Magdeburg were expelled. The crusaders on their march through Bohemia forced the Jews to become baptized, killing those who refused, notwithstanding the remonstrances of Bishop Cosmas. Next year, however, on the return of Emperor Henry from Italy, he granted them permission to revert to their ancestral faith (Pertz, "Monumenta," ii. 181), notwithstanding the protests of Pope Clement III. (Jaffe, "Regesta," No. 5336). 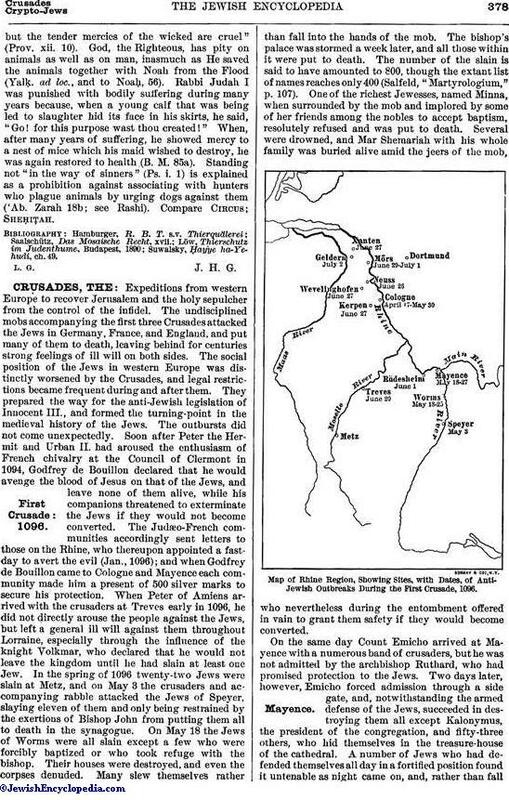 The Jews of the Rhine district were decimated: it has been calculated that about 4,000 were killed or slew themselves. The few survivors of Mayence who had taken refuge at Speyer did not return to their old homes until 1104, when a new synagogue was dedicated (September 22). When the crusaders at last stormed Jerusalem, July 15, 1099, they drove all the Jews into one of the synagogues and there burned them alive. During the preparations for the Second Crusade a narrow-minded monk named Radulph preached the Cross in the Rhine valley, and declared that the Jews should be slain as the enemies of the Christian religion. Bernard of Clairvaux protested energetically against the unchristian behavior of Radulph, and only a few isolated cases of outrage occurred. The Jews were expelled from Magdeburg and Halle. Bernard went to Germany to preach the Cross, and met the monk Radulph in open disputation at Mayence in the beginning of November, 1146, but failed to influence the people in favor of the Jews. He accordingly addressed a letter to the peoples of western Christendom, protesting against the persecution of the Jews. Notwithstanding this, when the crusaders came to Würzburg they slew the rabbi, Isaac ben Eliakim, and about twenty-one men, women, and children, whose bodies were buried by the bishop in his garden. This was ultimately purchased by Hezekiah, the brother of the rabbi, as a graveyard for the Jews (see Würzburg). At the coronation on Sept. 3, 1189, of Richard I., before he started for the Third Crusade, a severe riot occurred, and after he had left the country the crusaders who were preparing to follow him attacked, with the aid of the populace, the Jews at Lynn, Stamford (March 7), Bury St. Edmunds (March 18), Colchester, Thetford, and Ospringe. The chief tragedy, however, occurred at York on the night of March 16, 1190, when 150 Jews of all ages, headed by Rabbi Yom-Tob of Joigny, immolated themselves to escape slaughter or baptism (see York). 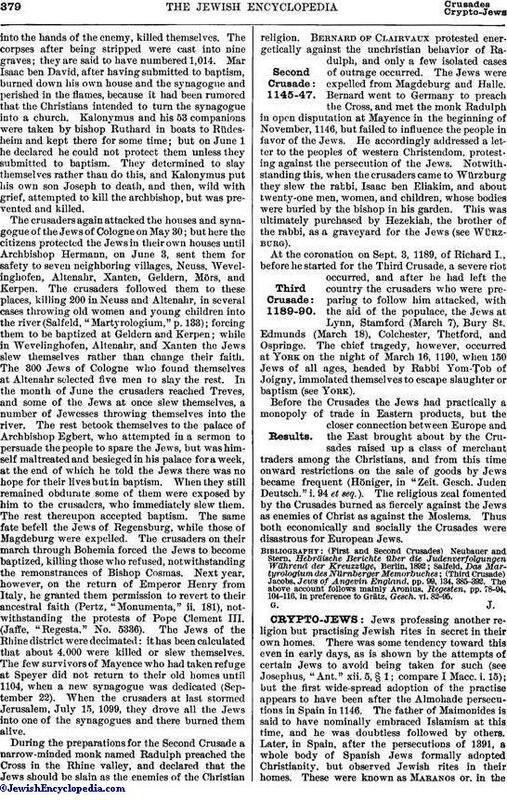 Before the Crusades the Jews had practically a monopoly of trade in Eastern products, but the closer connection between Europe and the East brought about by the Crusades raised up a class of merchant traders among the Christians, and from this time onward restrictions on the sale of goods by Jews became frequent (Höniger, in "Zeit. Gesch. Juden Deutsch." i. 94 et seq.). The religious zeal fomented by the Crusades burned as fiercely against the Jews as enemies of Christ as against the Moslems. Thus both economically and socially the Crusades were disastrous for European Jews. (Third Crusade) Jacobs, Jews of Angevin England, pp. 99, 134, 385-392. The above account follows mainly Aronius, Regesten, pp. 78-94, 104-116, in preference to Grätz, Gesch. vi. 82-95.